The exterior Plantation shutters were inspired by the vintage movable louver shutters seen throughout the South on Antebellum mansions. In the past Plantation shutters were used extensively as exterior shutters. The exterior louvers could be manipulated from the inside of the home when closed. Exterior wood louvered shutters allowed for control over ventilation and light. With the advent of A/C and window screens this functionality was lost. 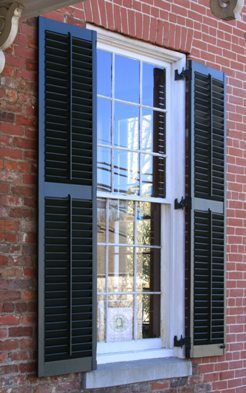 The Savannah Plantation exterior shutters restore these historical details to any vintage or new structure. Our shutter craftsmen use mortise & tenon construction to ensure years of structural integrity. These wood louver shutters are built to last a lifetime. Click on one of the exterior plantation shutters below for information and pricing!